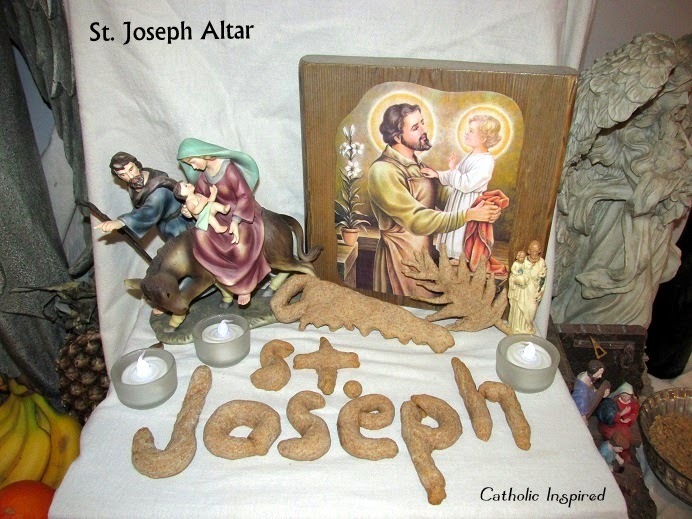 A few days ago I shared a list of things that are traditionally placed on a St. Joseph Altar - HERE. 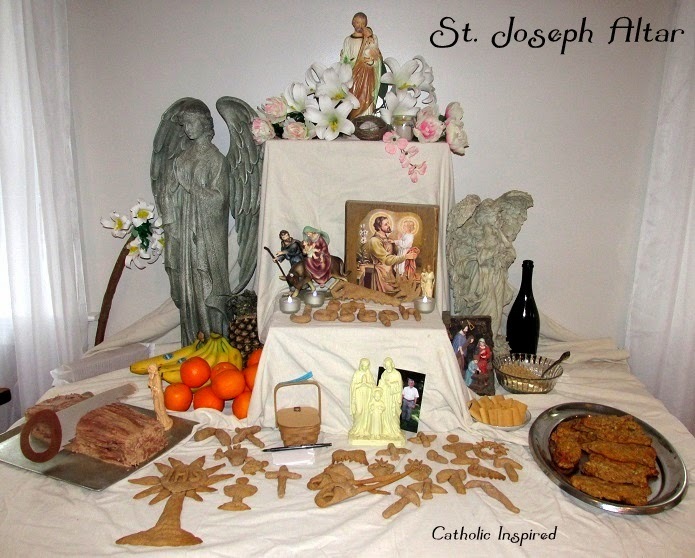 Today I want to share the altar our family made to celebrate the Feast day of St. Joseph! This is our first year making an altar, and this is the completed altar. 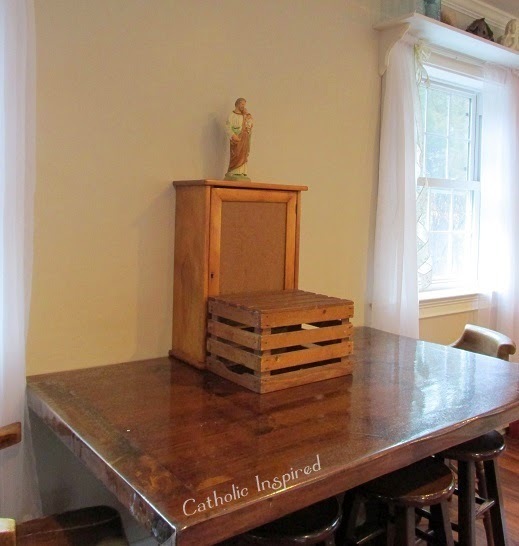 It's a small end-stand, a wooden crate, and our table. 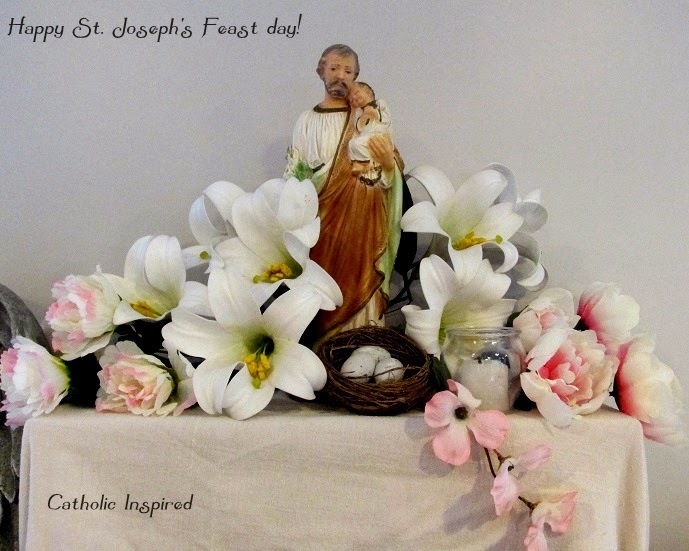 St. Joseph is on the top with lots of flowers and a candle. 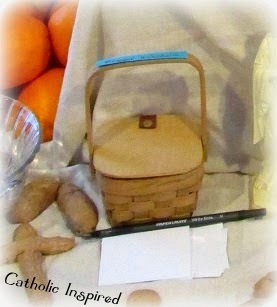 I placed the bird nest there as a reminder of the swallows of Capistrano! The swallows return to Capistrano every year on March 19th! Here is the shaped flat bread; made by Elizabeth (She turned 10 today!! 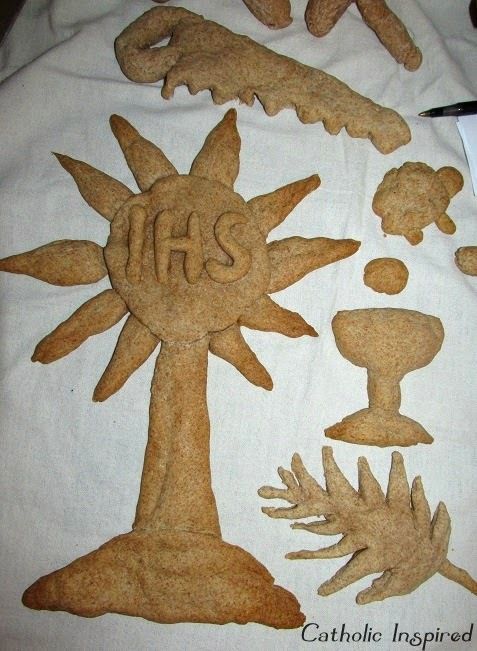 - and she's proud to share the day with St. Joseph), Hannah (age 8), and myself. This is our second tier on the altar. 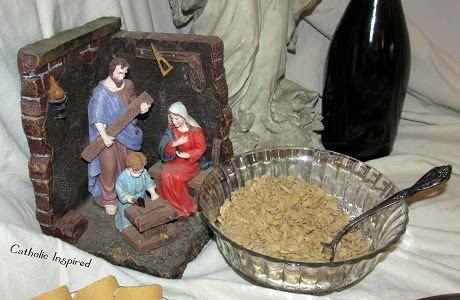 Sawdust - Cracker crumbs - Which were good with our soup! Our "whole" fish which were made with the Tuna Ball Recipe. 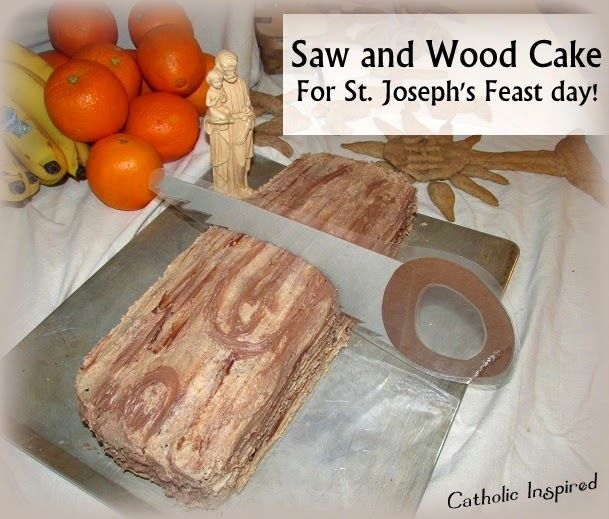 Our yummy cake shaped like a piece of wood and a saw! I have posted instructions to make this cake HERE. All went well for our first year of creating an altar! Hope you all had a blessed day!! 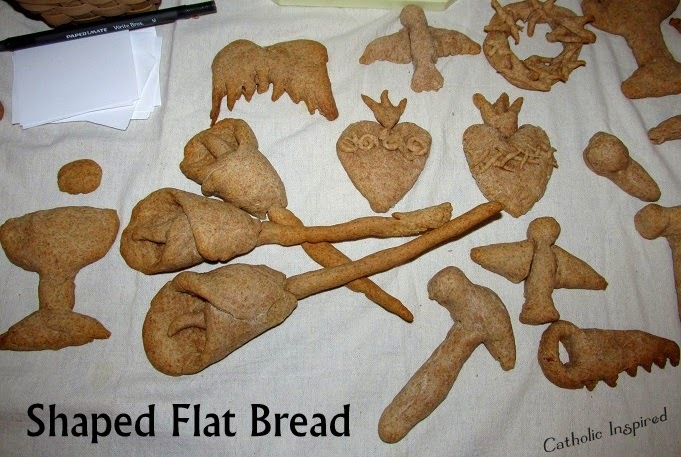 The flat bread shapes are so artistic - wow! Good job Elizabeth and Happy Birthday! 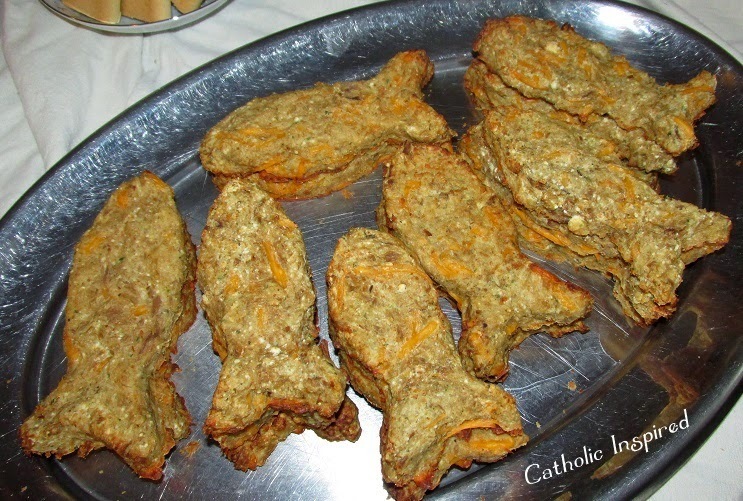 I'm glad you linked your Tuna Ball recipe again, thanks...How fun in the fish shape!